In 2009 veteran journalist and eight-time Emmy award winner Lu Ann Cahn was feeling angry and frustrated. The economy was tanking. Her job was changing. Budgets were being cut. She resented the new technology and social media she was being asked to embrace at work. In a word, she felt "stuck." Cahn's daughter encouraged her to try blogging, and after some thought, she decided to write about trying something new every day for a year. Little did she know, that "Year of Firsts" would change her outlook on life. -Taking a drum lesson from a famous 80s rocker In the process she discovered that "firsts" were the antidote to "stuck." 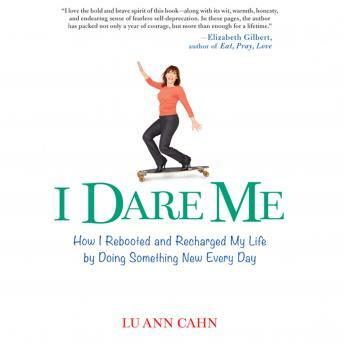 I Dare Me is Cahn's journey, but it's more than just a memoir. It challenges listeners to confront their own fears, and encourages them to try their own "firsts."